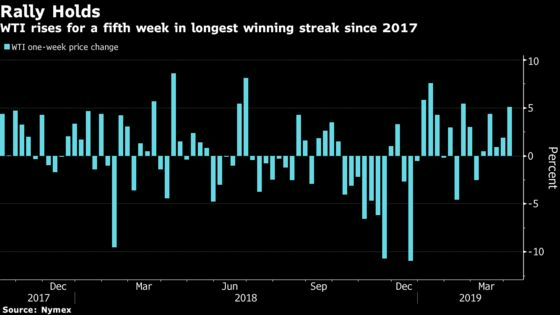 (Bloomberg) -- U.S. crude capped its longest winning streak in almost 18 months as global supplies strained and positive U.S. economic indicators bolstered the demand outlook. Futures gained 4.9 percent for the week, joining a U.S. stock-market rally that approached an all-time high on Friday. Already boosted by fresh signs of OPEC production cuts, crude was further buoyed by a monthly employment report that topped estimates. West Texas Intermediate crude has climbed almost 40 percent this year as the Organization of Petroleum Exporting Countries and allies trimmed production to prevent a glut. Escalating tensions in Libya and Venezuela have also supported prices, with worries about economic growth and booming U.S. shale output providing the only checks on the rally. WTI for May delivery advanced 98 cents to settle at $63.08 a barrel. The five-week advance was the longest since November 2017. Brent for June settlement gained 94 cents to $70.34 on the London-based ICE Futures Europe exchange. The global benchmark crude was at a premium of $7.19 to WTI for the same month. Gasoline futures rose 1.5 percent to $1.9687 a gallon. Excluding production-sharing agreements, Russia has cut its average oil output in April by 225,000 barrels a day, Energy Minister Alexander Novak said in Moscow. U.S. sanctions on Venezuelan and Iranian oil, as well as output cuts by the Saudi Arabia-led OPEC+ group, are creating a shortage of heavy to medium crude that’s sulfurous and dense.